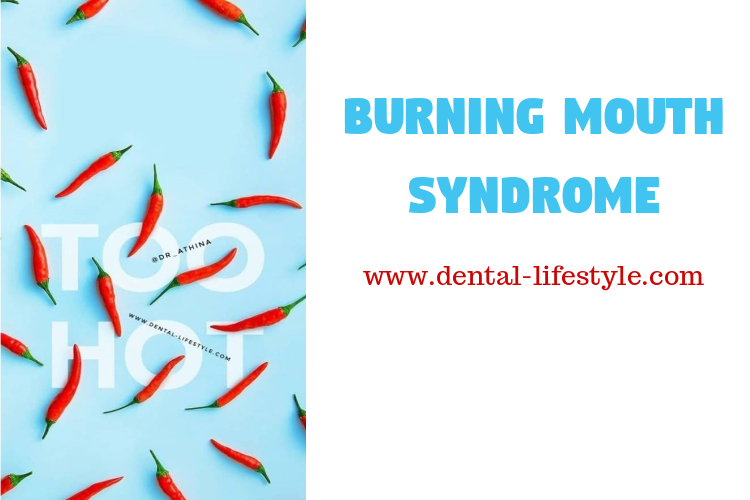 In burning mouth syndrome, burning sensation can occur in the tongue, lips, palate or even in the floor of the mouth. This sensation is created when the sensations of taste and temperature are transferred to the brain by the nerves in a different way than usual so that they are not properly understood and cause pain or burning. The areas of the mouth that burn, when we actually touch them are not hot and most of the time there is no wound or red area. Other symptoms may include numbness or pain in the mouth or the tip of the tongue, metal or bitter taste or dry mouth. The syndrome is often called neuropathic pain, as it occurs when there is damage to the nerves. Often the syndrome occurs in middle age and older women and the symptoms appear gently in the morning, they peak in the afternoon and disappear in the evening. In some people the burning sensation is constant and in others, we notice remissions and exacerbations. Most of the times, the combination of two or more of the above causes a headache.